I was recently chosen to participate in one of Influenster's VoxBox programs, and I couldn't have been anymore excited. My Sprout VoxBox contained an interesting mix of health and wellness products that I can't wait to explore further. I have already tried out a couple of the items and so far so good. 1. Eatsmart Three Bean Tortilla Chips: I love snacking on chips-even better if they are a healthier alternative. These are made with pinto, navy and black beans, and they contain 14 grams of whole grains. They are also gluten free, and made with non-gmo ingredients. I think these chips are great. Very flavorful and so addicting. Highly recommend! 2. Curate Bar (Dark & Tempting Flavor: I snacked on this bar the other day and it was just okay to me. It was tasty-somewhat, but I found that the flavors were a little muted and not so overpowering. But, I did like the chewy texture, and it was fairly filling. 3. Orgain Organic Protein Powder in Vanilla Bean: I have been on the search for a good protein powder and I am hoping that I like this one. It's plant based, organic, vegan, non-gmo, soy free, and gluten free. 4. Ecos Hypoallergenic Laundry Detergent: This detergent is made with plant-derived ingredients that effectively protect color and fabric. The formula is free from formaldehyde and dyes, and it also contains a built-in fabric softener. I have the magnolia and lily scent which is toted as ultra concentrated. 5. Clairol Hair Food Moisture Collection: I am no stranger to this shampoo and conditioner duo. I have used these before and I think they are a nice alternative to other shampoos and conditioners that contain harsh ingredients. The Hair Food Moisture shampoo and conditioner definitely impart some much needed hydration on my hair, and I love that they are free of parabens, silicone and mineral oil. 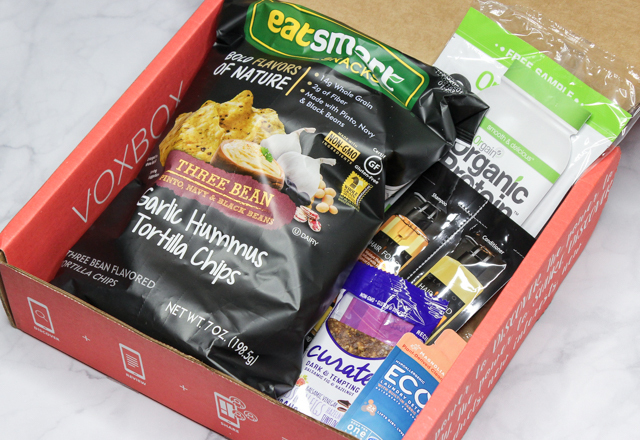 What do you all think of the Sprout VoxBox? Disclaimer: The products mentioned above were received complimentary from Influenster for testing purposes. For more information, please visit my disclosure page.